You can sign up for an account in the Settings. 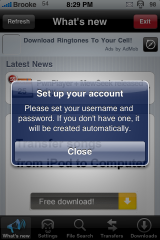 If you already had an account for iSlsk…you can use that same username and password. File Search still allows you to search for files and looks exactly that same as it did before. The same goes for the Transfers option…looks and functions the same as before. The only option that is not currently available is the Downloads option. 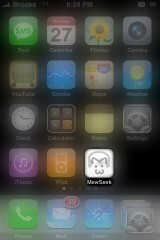 MewSeek does not (at this time) download the files to your stock iPod application on your iPhone or iPod Touch either. However, the files that you download can be played via PwnPlayer. They show up in PwnPlayer’s File System section and play with no problem (at least the ones I tried). Overall MewSeek works great…I did not have any issues using the application. I also love that it continues to download files in the background when you close the application. When MewSeek is connected, you will get a little MewSeek icon on your Status Bar. To disconnect MewSeek just go into Settings and select the Disconnect button in the upper left corner. Like all P2P clients, be sure to read all information regarding the use of this application before using. Hm, is it legal to download music from this? Im in class right now, so I cant read the license agreement. It is only legal to download music that you already own or music that is open source (has no copyright). It would be illegal to download any music other than that. 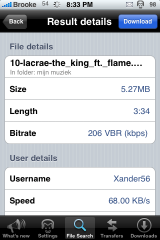 torrent downloads to the iPhone oO for videos directly to the iPod Stock App. 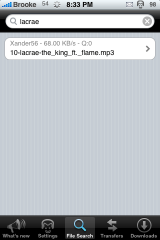 I’ ve installed this but after download music it doesnt save music!! I reboot my iphone and it worked! I have never been able to transfer files to my phone using an Open SSH clients.. I’m not sure why, but it never recognizes my iPhone 3G. 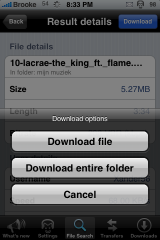 Using Mewseek will I be able to for example download Roms to my iPhone? 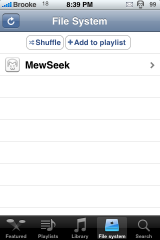 Mewseek is just for music. SO IS THIS KINDA LIKE LIMEWIRE? You should check out “dTunes”. It’s just like “MewSeek” only the PwnPlayer is built into one app instead of having two seperate apps. Also, dTunes has a better/faster search engine. The selection is the same though but download speads are much faster on dTunes. And dTunes has the ability to create & brouse album/song folders. You can also delete songs without SSHing. 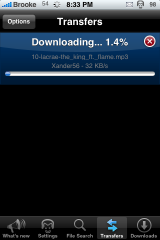 I love iSlsk and still have it on my iPhone 1.1.4 but I use dTunes on my iPhone 3G. After the first song download, the other downloadsdont show up in pwnplayer file list. Any ideas what I need to do to fix this? It’s a great app. Also can you disable the pwnplayer from being the default player on your lockscreen? hey guys, I am just trying and trying and I get to finish the download of a song but after that it doesn’t show on the filesystem of pwnplayer, anyone knows why?? I already tried restarting the iphone but no change at all. in settings on pwnplayer change the file system directory to var/mobile/Media/Downloads and you should see your downloaded contents under the. file system tab. 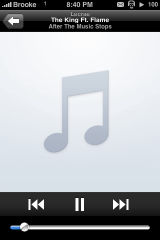 I downloaded some music but theres a couple of songs that i want to delete from my pwn player how can i do this???? Como obtengo una cuenta en mewseek, o como hago para que pueda conectarse? This program gave me back slot of money wasted.